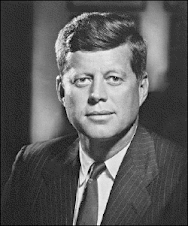 Justice For Kennedy: Additional evidence confirms that Oswald's escape from Dealey Plaza via public transportation was a fiction. Additional evidence confirms that Oswald's escape from Dealey Plaza via public transportation was a fiction. Of course you should start here with my prior article on this. Oswald's escape by public transport is the only option available to the police. If Oswald was seen or photographed by anyone in a car that raises the question of an accomplice and now you've got a conspiracy on your hands. So, they had to go with public transportation. The problem is Oswald has to go from point A, the TSBD, to point B, his room at 1025 N. Beckley within about 30 minutes, or less. This time problem limited the available options for an escape by public transportation. According to William Whaley's bus manifest he's picking up a fare at the Greyhound station at 12:30 p.m. the exact time of the assassination.. Gil Jesus has done some excellent work on this topic. He has a nice scan of Whaley's bus manifest. 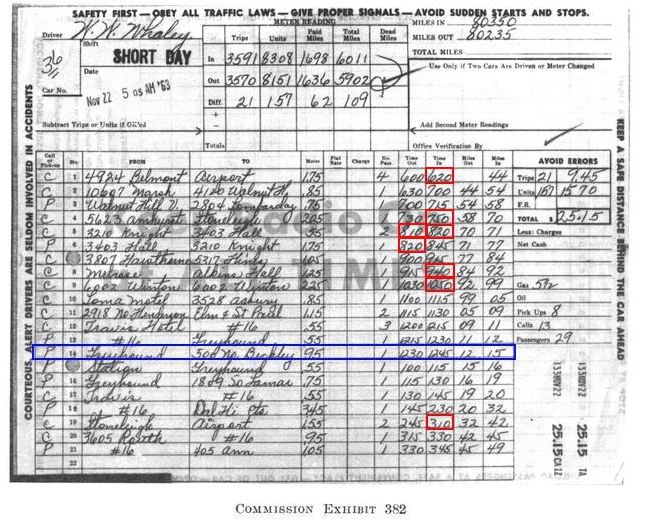 ( see below ) Obviously concerned about Whaley picking up a fare at the exact moment the shooting started in Dealey plaza ( see the information in the blue box ) the Warren Commission tried to tell us that he did not keep accurate accounts of when he picked up a cab fare, that he rounded them off to the nearer quarter hour. But, you can see this is not true. The boxes in red are clearly not marked in 15 minute intervals, 6:20, 7:50, 8:10, 8:20, 9:40, 10:50, or 3:10. By the way, this Greyhound bus station still exists. It is located on the corner of S. Lamar and Commerce. It's is just two blocks east of Dealey plaza. 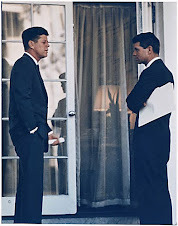 So, let's look at the affidavits of McWatters, the bus driver and Whaley, the cab driver supposedly taken on 11/22/63. You will notice some similarities. Let's look at Cecil J. McWatter's affidavit. It's here. You will note that McWatters explains he picked up a passenger at 12:40 p.m. If true, this alone rules out the passenger being Oswald. 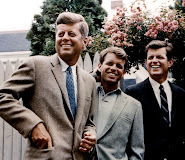 How could Oswald be on McWatters bus, and be the one who grins at the news of JFK's death, get off this bus, go over to the Greyhound bus terminal to get into Whaley's cab which had left at 12:30? The Dallas police had to explain, how did Oswald get over to the Texas theatre where he was arrested. They had to do it using public transportation. Someone finds out that there's a bus stop right in front of the TSBD. Great, they'll use that idea. There is no mention of anyone leaving after McWatters picks up a guy on Elm St. around Houston. Weren't we told that Oswald walked down Elm St. heading East, that is away from Dealey plaza several blocks before getting onto this bus, one that is headed right back to Dealey plaza? Doesn't he leave it prior to it getting stuck and long before it got to Elm and Houston? 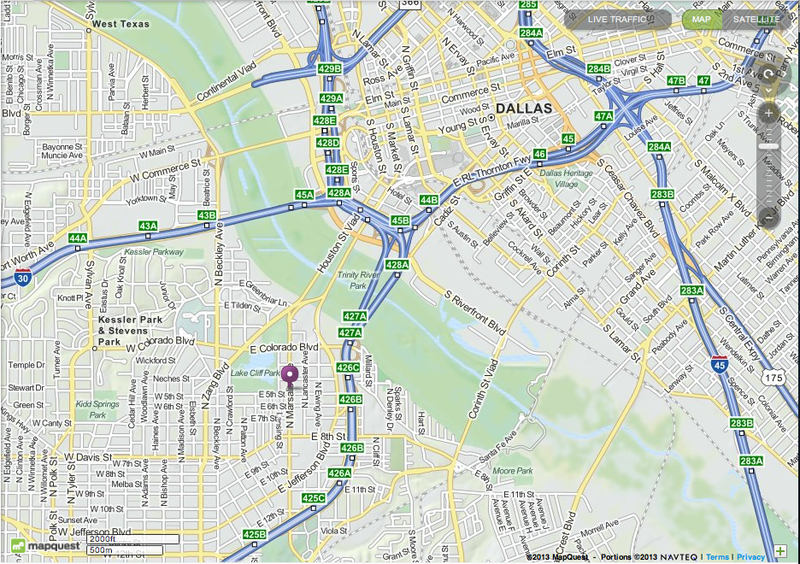 McWatters states he went on out over to Marsalis St., which is about 2 or 3 miles away from downtown Dallas. 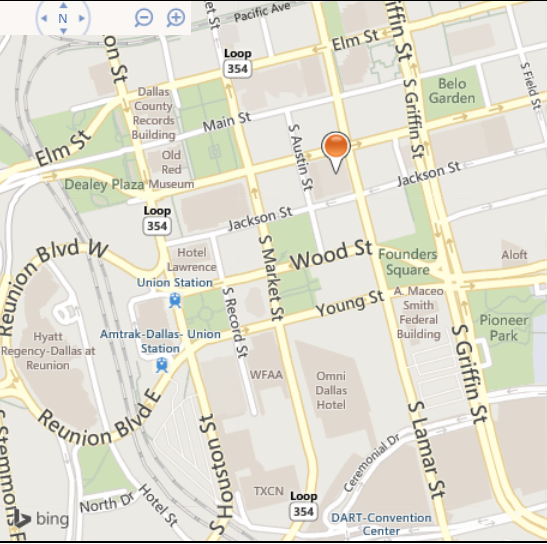 Pin is on Marsalis St.
Go ahead, Google "N. Marsalis Street, Dallas, Texas," for yourself. Marsalis St is not a cross street on Elm. McWatters picked up a woman once he got on Marsalis. McWatters asked her as she got on if she heard the news the president had been shot. She did not, and didn't believe this was real. McWatters told her if she doesn't believe him to ask the passenger sitting behind her. This passenger supposedly told McWatters the president was shot in the temple. This passenger was grinning and did not say anything. The woman did not think it was a grinning matter. This passenger cannot be Oswald. Oswald got off the bus prior to it getting to Elm and Houston. If you believe he got on at Elm and Houston St. you'll have to explain how that works. If Oswald got on McWatters bus at Elm and Houston it then goes directly over the Houston St viaduct and stops damn near his room at 1026 N. Beckley. Did Oswald just stand at a bus stop waiting for a bus to come? Remember, there was quite a delay in the traffic moving that was stopped at the corner of Elm and Houston because of the motorcade and it got worse after the shooting. Oswald does not need to go to Marsalis St. He cannot be the grinning man. McWatters states he let this passenger get off on Marsalis St. but this is crossed out. This man, who grinned, and got off on Marsalis St was Roy Milton Jones. McWatters bus got stuck in traffic on Elm St. There is a report by Roy Milton Jones that police came up Elm and talked to everyone on the bus. McWatters bus does not get Oswald to his room on 1026 N. Beckley in time for him to then get over and kill Tippit. They have to get him off the bus. If Oswald got on this bus and stayed on it, stayed on it while it was stuck in traffic, stayed on it when the police asked questions of the passengers, stayed on it as it finally crossed onto Houston and over the viaduct it's his alibi, at least for the Tippit shooting, as he could not have gotten to 10th and Patton in time to kill Tippit. Now, they need to get Oswald off the bus. You will also note that this affidavit is not signed by McWatters. We don't really know who wrote this. No Dallas official's initials are on this at all. It is not signed, initialed, or dated. 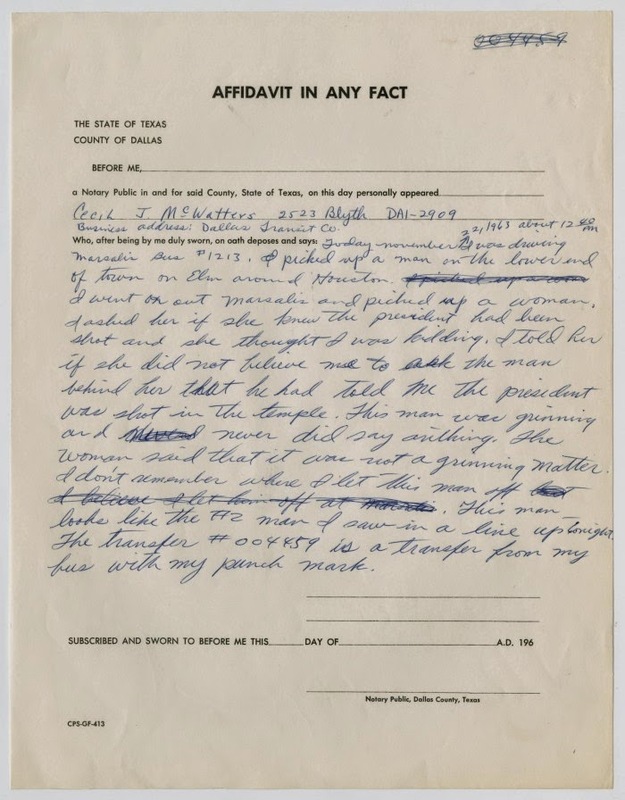 Let's look at William Whaley's handwritten affidavit. Gil Jesus discovered that there's two of them. Here's the first one. 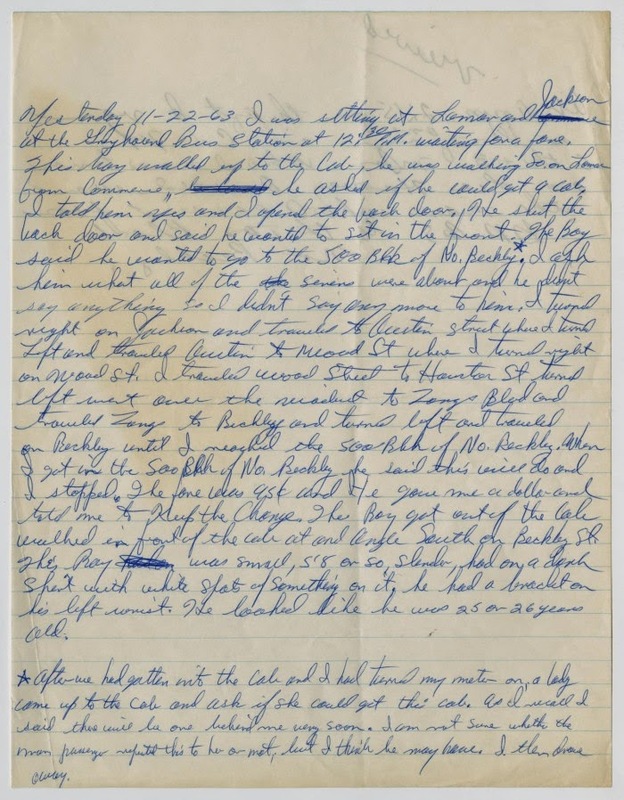 This first one appears to be taken by Detective L. D. Montgomery, in other words this is Montgomery's handwriting, and not the handwriting of Whaley. Montgomery's initials are in pencil on the bottom right. This is not signed by William Whaley. It is not initialed by William Whaley. It is not dated. You'll note that there's something missing from Whaley's story on this first affidavit. 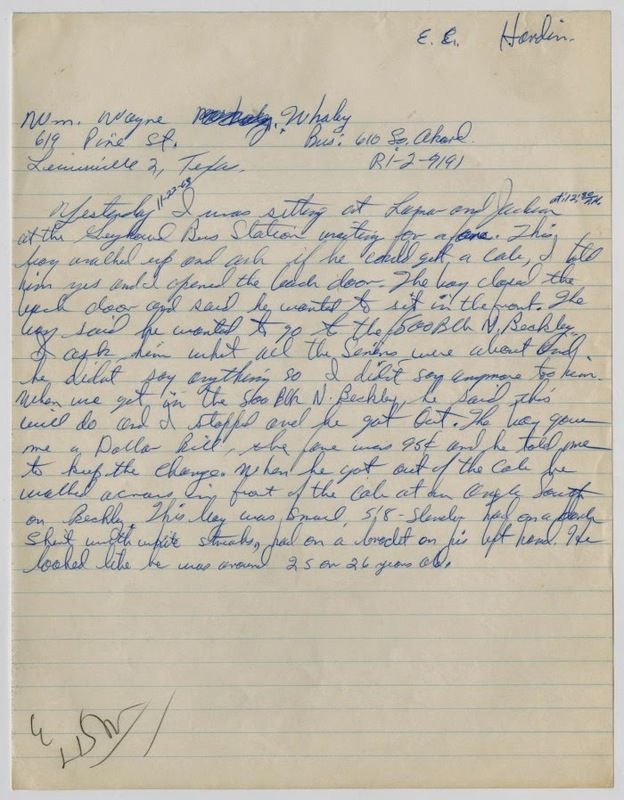 There's no mention of a woman coming up to Whaley's cab, with the passenger, supposedly Oswald, already inside, asking if she could have this cab. You'll also note the time when "a boy" came up to William Whaley in his cab asking for a ride is put in at 12:30 .p.m. 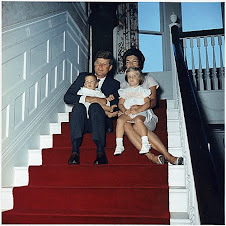 If you believe Oswald is the lone gunman then he's on the sixth floor shooting Kennedy at this time. He can't be there and over at the Greyhound bus station getting a cab at 12:30 p.m. Here's the second affidavit. We do not know who wrote this. This is not signed by Whaley, or by anyone else for that matter. It is not dated. Montgomery's initials are missing as well. 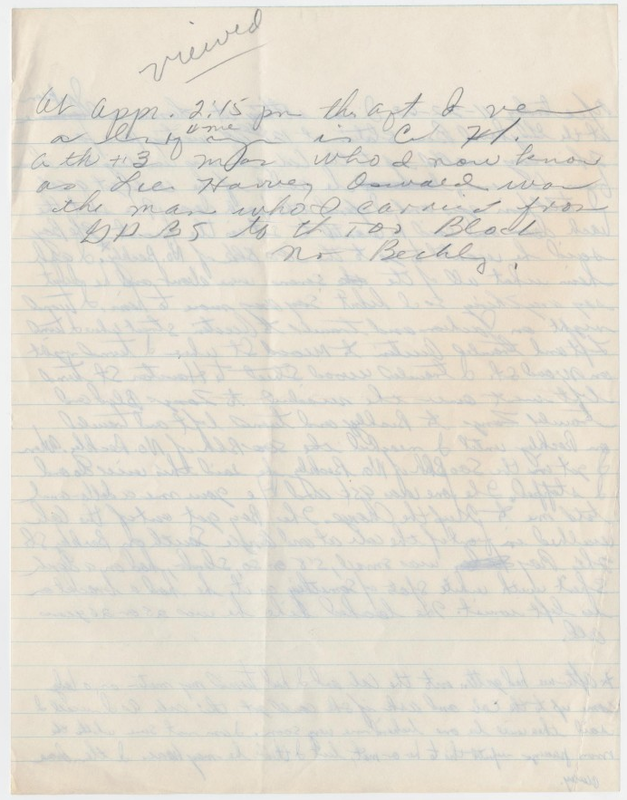 However, it does look to me to be the same handwriting as Montgomery's. I base that on looking at the word yesterday. This is the back of the second William Whaley affidavit. For some reason this is in pencil while the front is in blue ink. This second affidavit does have the story of a woman asking for the cab. Also, Whaley's identification ( or really the misidentification ) of Oswald from a police lineup is here. Whaley chose the guy under #2, Oswald was under #3. And the destination changes from the 500 block to the 700 block. This helps with the timing problem of getting Oswald into and out of 1026 N. Beckley St. and onwards to killing Tippit. And this passenger in Whaley's cab walks south on N. Beckley which is in the opposite direction of 1026 N. Beckley. So, we have affidavits that are not in the handwriting by the people they're supposedly coming from. They are not signed by the people they're supposedly coming from. They are not dated. And they show evidence of editing. Hell, Whaley's two affidavit's are not even on a DPD affidavit form. And I'm not even getting into Whaley's ridiculous statements about what clothes his passenger wore. The analysis that Oswald was never on Cecil McWatters bus, nor in William Whaley's cab is 100% true and rock solid. Sylvia Meagher and others came to the same conclusions I have presented way before I came along. So, since the public transportation story is a fraud does this mean Oswald got into a Nash Rambler station wagon? No, that one is proven false does not mean the other is proven true. Is Roger Craig's story correct? It could be. As far as I'm concerned, how Oswald got over to Oak Cliff remains a mystery.